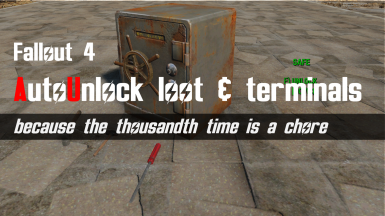 Auto detect locked loot containers, doors and terminals every 5K radius of the player and unlock them based on Locksmith and Hacker perk level. Plus at least one bobby pin inventory for locks. Does not unlock owned, custom or quest specific objects. When enabled, after every 5,000 units of player movement the 6,000 game unit radius around the player is scanned for base game Loot containers, non teleportation doors and basic Terminals that are locked, unowned and not part of a quest. If the player has one or more bobby pins and the right perk for the lock level, it is unlocked for you. There is a small chance (default fLockpickBreakBase game setting is 5%) that a bobby pin will break on each unlock, which you will hear and is reported if you have messages enabled. If XP is enabled, lockpicking is awarded at the right level but XP for terminal hacking uses the lockpick values as calculating hack values is too much faff. Companion affinity cooldown ensures that max one event is generated per search radius. 1. 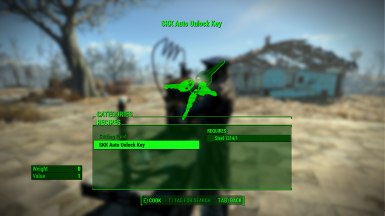 SKK AutoUnlock is set to enabled in the key configuration - check. 2. At least one bobby pin in MISC inventory (for locks, not terminals fool) - check. 3. Do you have the right perk level - check. 4. It is not owned by someone (red text) - check. 5. Then it is not a generic loot container or terminal. Compatibility: The mod has no dependencies on extenders or DLCs and does not change any existing base game scripts, assets or objects. 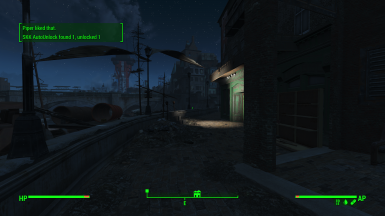 As with 98% of SKK mods, its 100% pure new Creation Kit forms and scripts. This means that it has no load order dependency and can be safely disabled when you get bored with it (if you run the disable config option first). Known Issues: ~ None, it just works. 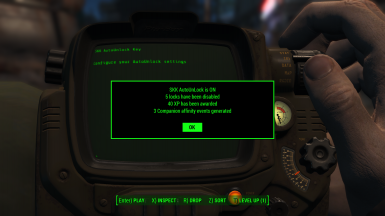 Nexus PC manual download installation: Copy SKKAutoUnlock.esp and SKKAutoUnlock - Main.ba2 to your ...\Fallout 4\Data directory, enable in the Bethesda mod menu, mod manger or whatever. Disable & removal: You can disable the mod at any time, but be neat and run the disable configuration option first. Only remove mods if you are happy to accept potential conflicts from load order changes in a save game. 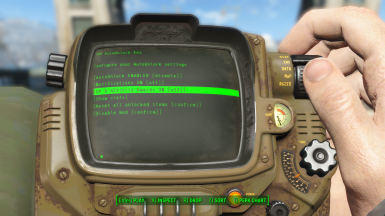 Bethesda.net users: Disregard PC manual install and console sections. I use this same description text on nexusmods.com and bethesda.net as I CBA to maintain multiple edits. What about unlocking doors ? The list of door types detected in V004 is limited, as processing the number of doors found in a downtown radius can have a performance impact on your system. SKK mods don't do that sot of thing. What about an ESL version ? SKK mods will not be published in ESL format, because life contains sufficient hassle. What about MCM ? Sure, as soon as MCM supports XBOX as 90% of SKK mod users are on that platform. You can write an MCM json thing (whatever it is called) with the Console Configuration article info. I'll pack it and give you props. PlayStation® can not be supported due to Sony Corp. scripted content restrictions.